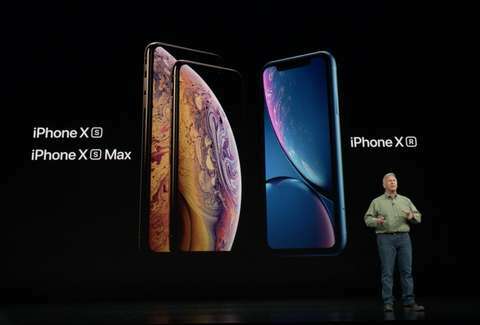 Apple officially announced its lineup of brand-new iPhones on Wednesday, finally ending the months of speculation and mystery surrounding the 2018 models' key features, like screen sizes and battery life. Like all Apple events, there was a lot to process between the slideshows and Tim Cook's affable southern drawl. With the informational overload, choosing a phone might seem like a daunting task, but fret not. We've created a simple and hopefully handy comparison of all three of the new models, to help you get a better sense of which iPhone you're willing to drop hundreds of dollars on. Specifically, we looked at important features that set each phone apart from one another, including storage sizes, prices, camera specifications, battery life estimates, display sizes, and more. Water Resistant: Water resistant within up to 2 meters of water for 30 minutes. Wireless charging: Compatible with Qi chargers3. Water Resistant: Water resistant within up to 1 meter of water for 30 minutes. Check back for more updates on everything you need to know about Apple’s 2018 iPhone announcements, including how they compare to last year’s models, the new color options, when you can pre-order them, how much they’ll cost, the new iPhone sizes, info about iOS12 and more.